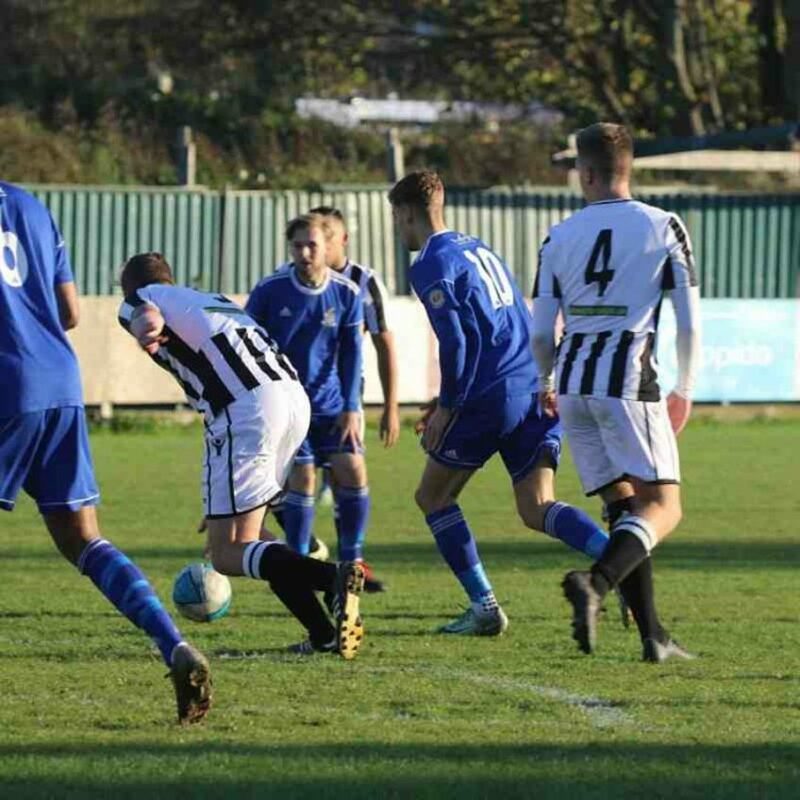 Redbridge made it through to the 3rd Round of the FA Vase after coming through a tight struggle with Peterborough Northern Star, who despite the long trip down gave the hosts plenty to think about. The Motormen got going as early as the 4th minute when Samuel Phillips turned and fired a low shot that Quincy Shorunmu tipped away. Soon afterwards some excellent link up play between Jack Stevenson and Ashley Blackburn played in Phillips who again got a shot off, this time being blocked on the line. And just past the quarter hour mark Bryan Kyungu blazed a shot over as Redbridge continued to have most of the early chances. The visitors came out of their shell and had a chance of sorts in the 20th minute; a diagonal shot from Matt Barber requiring Lewis Greene to make his first save of the afternoon. But soon afterwards a long throw from the right caused some panic in the Redbridge defence as Vinny Murphy ended up heading the ball towards his own goal, Greene being forced to dive and claim the ball on the line to prevent Northern Star taking the lead in the most calamitous of circumstances. But just when it looked like the visitors were starting to get a foothold the hosts went and took the lead. A Redbridge move forward eventually worked its way to Blackburn on the left hand side of the box; the resulting curling shot looked everything like a goal the moment it left his boot, and so it proved as the ball bent round Shorunmu’s desperate dive and landed in the net. The visitors had to do a bit of further defending, with Kyungu having a shot blocked. But the visitors created a good opportunity just before the break when Jake Sansby went on a great little run before poking his effort narrowly wide. Peterborough Northern Star opened the second half on the front foot. A long throw found Josh Rosser at close range but he somehow placed his shot over, wasting the best chance the visitors had created thus far. And the visitors stretched the Redbridge defence as they went on to win three successive early corners inside the opening five minutes of the second period. But Redbridge went and had another go themselves in the 55th minute. Blackburn paced down the left wing, crossed to Larry Asare who could only rifle a shot well wide of goal. But a Redbridge free kick, taken by Murphy, ended up being spilled by Shorunmu but luckily for the visitors the ball just eluded Phillips who was following the ball in. One goal is never enough of a lead and having had a couple of attempts to extend their lead, Redbridge then had to be back on defensive duties to maintain it. Sansby got himself in a good position to let fly, Asare putting his body on the line to deflect the shot away. Redbridge had an effort of their own blocked soon afterwards, Phillips the man denied. Then the hosts had a fright as Rosser turned and hit the underside of the cross bar with a powerful volley. Another ball over Redbridge’s defence then set Barber free and his shot forced Greene to pull off a great save. And although Redbridge were able to win a corner after Phillips had a shot deflected away, it was definitely the visitors that were on the front foot as the game reached the final fifteen minutes. A free kick by Christian Le was dinked to the left of the Redbridge wall, allowing Liam Rodden to get a low sizzler off that Green was equal to. But Redbridge had a good call for a penalty in the 85th minute when Tommie Turner took a tumble after a very robust challenge; then the woodwork came to Northern Star’s aid as Stevenson had a shot parried by Shorunmu, with Asare’s rebound striking the foot of the post. But the visitors went on to make it a nervy finish for the home side. Vitor Vaz, who had been introduced in the 68th minute, was to have a flurry of late activity that almost paid dividends. But he was to be denied three times; first in the 88th minute when he was about to burst into the Redbridge box until Murphy put in a well-timed tackled to win the ball; then a minute late a ball over the top reached him but the offside flag was up and the move ended just there, meaning there was to be no one-on-one with Greene. And right at the death Redbridge had one final scare as a cross from the right was met by Vaz who missed the target by a whisker. The final whistle went almost as soon as Vaz had stroked wide; meaning that the Redbridge players and fans could take both a big sigh of relief and then experience some excitement at what awaits in the next round. Redbridge: Lewis Greene, Terrell Miller, Marcus Carter, Liam Burgess, Vinny Murphy (Capt), Bryan Kyungu, Daniel Smith, Larry Asare, Jack Stevenson, Samuel Phillips (Patrick Duggan 78’), Ashley Blackburn (Tommie Turner 78’). Scorer – Ashley Blackburn (31’). Peterborough Northern Star: Quincy Shorunmu, Lukas Gereltauskas (Vitor Vaz 68’), Jack Bloodworth, Harry Fitzjohn (Kieran Blanchard 64’), Liam Rodden, Matt Cox, Jake Sansby, Sam Wilson (Capt), Josh Rosser, Christian Le, Matt Barber.